So, that might answer a few questions about her... cupcakes. Possibly not safe for work. The media in the state capital of Albany, a.k.a. the world capital of boring, bristled with excitement from the moment it became clear that Andrew Cuomo would run for governor. 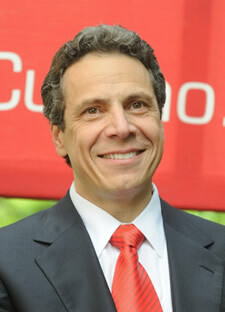 Not because of Cuomo so much as for the woman whose home he shares in Westchester. Eleanor Roosevelt aside, the First Ladies of New York have heretofore not merited inclusion on TMZ's stalk list. (Quick: State a single fact--anything at all--about Libby Pataki.) Sandra Lee was something entirely new: a bona fide famous person in her own right. We seem to have been absent on the days when the media here "bristled with excitement" over Sandra Lee. There were a few moments of amusement, sure (raises hand). Siobhan's description is probably more accurate. Of all the criticisms one could make of Andrew Cuomo, this is probably the weirdest (and dirtiest sounding): "public concubinage." Concubinage is the state of a woman or man in an ongoing, usually matrimonially-oriented relationship with somebody to whom they cannot be married, often because of a difference in social status. Well, there are certainly status differences here. She is more famous than he is. And a lot richer. Sandra Lee is featured in the latest issue of Vogue. The story, "Sandra Lee: The Woman in White," touches on her painful childhood, her relationship with Andrew Cuomo and her rise to Food Network fame. Some not-so-well-known facts that come out in the story: She's street savvy (when Sandra and the writer, Gully Wells, were walking in New York City she pulls Wells from some fast-moving cabs); she lived with her grandmother for her first four years and then was taken back by her mother and father, who both abused her; and she loves the color white. A lot. A creamy carpet covers the entire floor, a family of decorative polar bears frolics on the sideboard in artificial snow, an enormous silver tiger reclines on a mother-of-pearl coffee table, and in the fireplace are -- what else? -- white birch logs that are clearly never going to see a match. + New York's next First Lady-friend? Alas. She won't be here to "usher in a golden age of dinner parties and cocktail hours" in our fair capital. There will be no tomato soup lasagna. And local bartenders, note: you can scale back the ordering of appletini supplies. We're still holding out hope for great garnishes, though. Earlier on AOA: New York's next First Lady-friend? As Joshua David Stern notes at Eater, Lee does enjoy a cocktail -- and, when armed with a can of Pam, could have quite the effect on Albany. The Cuomo-Lee relationship also sets up an interesting possible situation: that the governor of New York's significant other could be both richer and more famous than he is. Page Six Mag had a piece this past weekend on the relationship between Andrew Cuomo and his ladyfriend, Food Network star Sandra Lee. Apparently it's all rides on the Harley, watching Ice Road Truckers on the couch and eating lasagna made with canned tomato soup. Cuomo and Lee haven't said much publicly about their relationship. But it does come up. Lee recently said on a talk show that she would cook in the Governor's Mansion (and bring "great garnishes"). She's said Cuomo is "the most amazing person I've ever met in every way" and referred to his kids as her "weekend daughters."